When Damssaul Dufrene first moved to Delaware from Gonaives, Haiti his goal was to become a nurse or a doctor. The medical field is highly respected in Haiti, and his family strongly encouraged him to follow one of those paths. Dufrene started at Delaware Tech learning English in the English as a Second Language program, before starting his path to a nursing degree. But the devastation caused by the 2010 earthquake in Haiti always weighed heavy on his mind. After talking to David Pedersen, department chairperson at the Owens Campus for architectural engineering, Dufrene changed his major and found his true calling. He increased his grade point average and graduated with a 3.51 GPA, made the Dean’s List, and was the program’s outstanding student at graduation. Prior to graduation, Dufrene and his classmates toured several different colleges in the hopes of transferring into one of their architectural engineering programs. His goal had been to transfer to a college close to Boston, but Delaware Tech’s articulation agreement with Morgan State University in Baltimore, MD was too good to pass up. Dufrene entered Morgan State as a true junior and will graduate in Dec. 2017. This winter he will participate in the Design Connect program, which places students with three design firms over the winter semester. The hope is the student will connect with one of those firms and get an internship for the spring or summer. Once he graduates, Dufrene has lofty goals that includes helping his home country as it continues to recover and rebuild. “My plan now is to start working in a firm for a few years, then go back to college for construction engineering, which I feel will allow me to help both Haiti and the United States, Dufrene said. 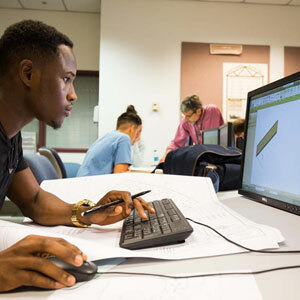 He has come a long way since his journey from Haiti to the United States, and his future was made brighter by the start he got at Delaware Tech’s Owens Campus. “I can say that Delaware Tech is one of the schools I will never forget,” Dufrene said. “I would recommend anyone to go to Delaware Tech.